User friendly digital price calculating. Platform Size 11.8" x 9.8"
Scale Size 4.3" x 13.1" x 12.5"
Class III NTEP Approved Legal For TradeThe National Conference on Weights and Measures certifies the CM 101 Legal for Trade with Certificate of Conformance Number 04-101A1. So, you can count on getting accurate readings time after time. Perfect for stores and markets where items are sold by weight. Great for Farmer's Markets, produce, meat and more. Automatic Price CalculatingWith this grocery scale, all ya have to do is enter the price of your product by pound and it will automatically calculate the price of what's on the scale. Rechargeable Battery PackYou won't have to worry about searching high and low for a wall outlet to plug this retail scale into. The CM-101 has an internal rechargeable battery with up to 120 hours of battery life on a single charge! Three Bright Backlit DisplaysYou'll have no problem at all seeing the weight displays on this pricing scale. The CM-101 displays have a bright backlight so ya can see your weights even in dim lighting. Stainless Steel PlatformThe CM101 has a durable stainless steel weighing platform to make cleanup a breeze. Unlike gold or silver, stainless steel doesn't scratch easily and keeps its shine without rusting or tarnishing. Easy To Clean Membrane KeypadYou won't have to worry about dust and dirt getting stuck under and around this scale's buttons...The CM has an easy to clean membrane keypad with accurately labeled keys for easy weighing. 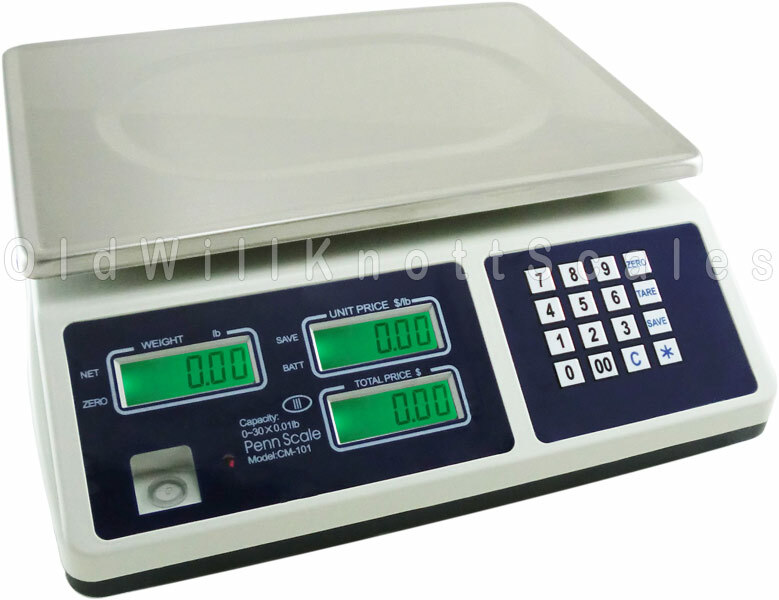 1 YEAR MANUFACTURER'S WARRANTY!This retail scale is covered with a 1 year warranty from Penn Scales against defects in material and workmanship. I like that the weight and price is readable on both sides. It was easy to setup and looks like it will be relatively simple to operate. We will be getting it certified soon. Most of our usage will be in the summer months to weigh vegetables and blueberries for research/demonstration trials and as a backup scale for our local farmers' market. Product is working great. Very pleased with purchase so far! I knew it didn't but seems like all caculating scales should have an output. We are happy with our purchase. Thank you for your prompt shipping. I am very happy with the scale. It is just what we needed for our small farm store. so easy to use. Turn it on, type in the price per pound and place the produce on the scale and the weight and cost display on both the front & back side of the scale. The unit is light weight and easy to move around. The company sent it next-day shipping for free! I have been using my new scale for my farm fruit vending business and I must say it is an excellent scale. I love the tare weight option as I use packing boxes and this just makes it so easy to calculate weight and price. The price is great for such a great product. I highly recommend this scale. Have been using my Penn Scale for a few weeks at Farmer's Markets and love it. I wanted a no fuss/no muss scale and this one has been perfect for us. 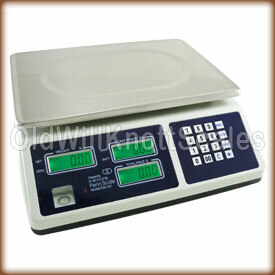 Weigh and calculate ... so easy to use, light weight and soooo portable. I don't leave the house without it. Couldn't be happier! 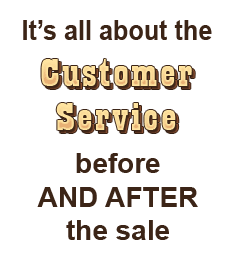 Thanks Old Will Knott your online store made my purchase one of the easiest transactions to date. Gotta go now and sell some more tomatoes! I have to get inspected a first time, here in WA State. If I buy this new and it fails calibration, the state says I have to pay to have a certified technician calibrate it. And then another fee for another inspection. My question: does Old Will Knotts use certain metal weights to calibrate before shipping? I would like an easy inspection. Thanks so much! Hey there Chuckie! All our scales are calibrated and tested by the manufacturer before getting shipped out. It's very rarely an issue, but sometimes when a scale is being delivered to an area with a drastic change in altitude, it can have an effect on the calibration. When folks are concerned with passing certification, we recommend that they purchase a weight to test themselves, or have a service come calibrate professionally before the certification date. Thanks for the great question! - Cletus N.
Can I take Penn scale to the farmer market without power cord . Because farmer market do have power outlet to use. Hey There Jim! You sure can. This scale includes a rechargeable battery pack, so just charge it up, and you're good to go! Does this scale come calibrated?